If you want to load large amount of data to OIM , you can use oimbulkload utility available with OIM. 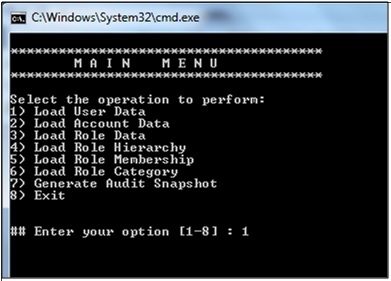 With this utility data like OIM Users, Organization, roles etc can be loaded. In this lab we are going to load users from csv file. 1) Create the "bulk.csv" file with following content as show in figure below and save it. 2) Paste this file inside "G:\Oracle\Middleware\Oracle_IDM1\server\db\oim\oracle\Utilities\oimbulkload\csv_files"
3) Create master.txt under csv_files folder. Write the name of csv file inside master.txt. In this case it is bulk.csv . It should look like the following image. 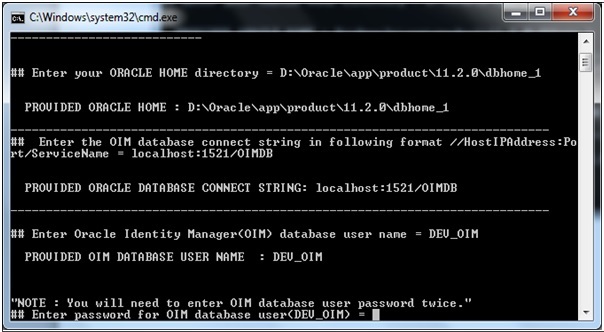 4) Open the command prompt and navigate to path "G:\Oracle\Middleware\Oracle_IDM1\server\db\oim\oracle\Utilities\oimbulkload\scripts" and run the command "oim_blkld.bat" . As shown in figure below. Note: Before running this command make sure that your JAVA_HOME variable is set. 5) As we want to load the user data, on the next screen type 1 and press enter. 6) On the next screen enter the following value as per your environment. After this enter the password and press enter as shown in figure below. 7) On The next Screen enter the following details. As we are loading the data from csv file, write 2 and press enter. Name of mater file="master.txt"TableSpace Name="DEV_OIM"
To insert the message write "Y"
8) At last you will get successful message as shown in figure below. 9) Login to OIM. Now you will see the user imported to OIM from csv file.